We hit the end of September, and, incredibly, the midway point of the regular season, with a surprising 4-0 team, a playoff-poised team needing to show more poise, a team with a new coach finding its footing, and a surprising 1-3 team trying to find its way. Let's look at Friday's action. After the miracle tackle from Jed Pinkston helped secure an ugly 7-6 win for the Patriots at home over previously unbeaten Henrico last week, Patrick Henry heads to Route 301 sky high, reaching 4-0 for the first time in a decade. It was also in 2006 when the Patriots last defeated the Hanover Hawks. At the time, the Patriots had won the first four meetings between the schools. But an opening night 24-21 Hanover win to start the 2007 season turned the tide, and the Hawks have won the last nine regular season matchups and ten games overall, winning the lone playoff game between the two in the 2007 Division 5 Region Championship Game. Will Travious Tyler be able to play after leaving the Henrico game early due to injury? If not, does Hunter Hart return to that position, which, in turn, questions how much he can go as a linebacker? Will the Hanover offensive line bounce back from a poor performance at Atlee last week, where the Raiders held the Hawks to under 200 yards of total offense, forcing Hawks quarterback Clayton Cheatham into a one-dimensional passing game, which is not the strongest suit for Hanover, especially as they continue to miss both Jack Chenault and Kirk Shaffner in the passing game? Patriot fans should not look at this game lightly. The Hawks are currently out of the playoff race in a very difficult 4A East Region, and they need wins now to keep their hopes alive. Hanover hasn't missed the playoffs since 2005, so expect an air of desperation from the Hawks, as they know the schedule continues to be unkind, with Highland Springs up next week. Meanwhile, the Patriots need assert themselves on the road early to avoid having to try to pull off a fourth quarter comeback for the third consecutive week. Patrick Henry is now on everyone's radar, the question is, how will these Patriots handle that? #5 Highland Springs (3-1) at Atlee (2-2), 7pm: These two teams have combined for an insane 266 points in their last three meetings. Atlee's last victory over the Springers came in their last meeting in Hanover County, a frigid early November night in 2013, 49-42. After losing at Highland Springs 65-37 in 2014, they fell behind early on a Monday night last year, losing to the eventual 5A state champions 49-24. This year's game should not resemble the past three. The Raiders look to make their mark on defense just as much on offense, and no longer runs the frantic hurry-up offense that, at times, forced the Raider defense back onto the field much quicker than they were ready to be. Atlee has to be thrilled after pitching the shutout against Hanover last week, but know the Springers have many more weapons on offense, and the task this Friday is to keep Highland Springs in their sights. Time-consuming drives that put points on the board, and winning the turnover battle, and the two biggest keys to this game. Highland Springs will score. Atlee can't let them get ahead by 14 or more points, especially after halftime. Armstrong (0-4) at #12 Lee-Davis (3-1), 7pm, Game Moved To Lee-Davis: The Confederates should be back to full strength after losing their first game last Friday 31-19 at Varina, letting a 19-10 second half lead slip away. The loss brought the Confederates back to the pack in a crowded 5A South Central playoff field, currently in the postseason in sixth place in a sub-region where the top eight teams make the playoffs, and no less than five teams are within a point of each other between sixth place and tenth place. CLICK HERE to see the current VHSL point standings. Would Lee-Davis have won last week with all hands on deck? We'll never know. So now, they must deal with the current reality, take care of business tonight, then get ready for a monster homestretch schedule, with home games against rivals Atlee and Hanover, a showdown against Henrico October 28th, and trips to both Highland Springs October 14th and Patrick Henry for the Tomato Bowl to close the regular season November 4th. The question is will the Confederates be able to secure enough victories to play for seeding in Ashland, or will they be playing for their playoff lives? It will be the latter if Varina, Matoaca, Meadowbrook and Mills Godwin have anything to say about it. And, Lee-Davis fans? Your wait is almost over. The Confederates make their 2016 Game of The Week debut next Friday, October 7th when they host Atlee. The game will be heard on WHAN, 102.9 FM, 1430 AM, will be available both online here from RVA Sports Network and heard on the TuneIn Radio App on "Radiall". 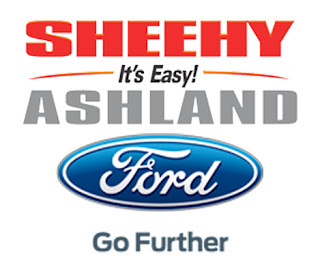 NOTE: Each Game Of The Week begins at 6:30pm with the "On The Sidelines Pre-Game Show Powered By Sheehy Ford of Ashland" as Rob Witham talks exclusively with NBC12 Sports Director Marc Davis previewing all the action in the Central Region! Monday afternoon, I had a tooth, meaning its crown, its post and its remaining top half, fall out of my mouth during lunch. Tuesday morning, I said goodbye to the rest of the tooth. So, due to the medication I am now on, I am not allowed to drive tonight, and therefore, our Game of The Week Boys Volleyball broadcast featuring Patrick Henry and Atlee is, unfortunately, cancelled. We are resting up and healing as quickly as possible, and following all doctor orders to ensure we will be ready to go Friday for our Game of The Week Football broadcast between Patrick Henry and Hanover on WHAN Radio (102.9 FM) and here on the RVA Sports Network. We are extremely disappointed that we will miss this Super 6 battle between the third-ranked Raiders and sixth-ranked Patriots. We will try our best to try to reschedule these teams if time left in the regular season allows. First, our Game of The Week on WHAN Radio (102.9 FM/1430 AM) and the RVA Sports Network, as Hanover comes to Atlee. Still the hottest rivalry in Hanover County, even if both teams are coming in at 1-2 with losses last Friday, both at home, as the Hawks fell 28-13 to #11 Hopewell, while Atlee saw a 14-0 fourth quarter lead evaporate as #9 Douglas Freeman scored with 6.2 seconds left to stun the Raiders 20-14. The importance of this game cannot be overstated. Yes, bragging rights are at stake as always, and Hanover remembers well seeing a 25-6 halftime lead disappear a year ago in Atlee's 31-point third quarter en route to a 44-40 win. Many of the main characters from that game are gone, but one who did not factor in that game returns: Hanover quarterback Clayton Cheatham. Injured last year, Cheatham missed eight regular season games, including this rivalry. Cheatham will be more than ready to finally get back on the field, now for the final time, against Hanover's arch rivals. Atlee will counter with both freshman Tyler Warren and senior Connor Young under center, both bringing their own skill sets to the Raider offense. Atlee counted on Clifton Woody to handle the bulk of the rushing carries last week as Chris Green was sidelined due to injury. This game will come down to three areas: turnovers, offensive line play, especially in the fourth quarter, and, frankly, positive desperation. Neither team wants to find themselves with a 1-3 record with the likes of Lee-Davis, Henrico and Highland Springs still ahead on their schedule. The road to the playoffs becomes much more difficult with that 1-3 mark as opposed to 2-2, especially in a very competitive 4A East Region this year, where Hanover not only has to worry about Dinwiddie and Monacan, but Louisa, Chancellor, Courtland and Eastern View. 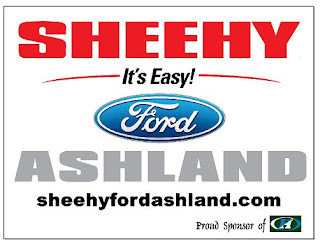 NOTE: We'll go live at 6:30pm Friday with the "On The Sidelines Preview Powered By Sheehy Ford of Ashland" as Rob Witham sits down with Marc Davis of NBC12 to preview all the Central Region action! Speaking of NBC12, Matt Estreich will be live all evening at Patrick Henry, where, for the second year in a row, the Patriots meet Henrico in a battle of unbeatens. Last year, a trip to Azalea Avenue did not go well for the Patriots, and they will look to use both the momentum whipped up by their amazing 31-point second half in last week's comeback road win at Mills Godwin 31-28, and home field advantage as the Warriors must come to Ashland for the first time since 2002. The Warriors may have lost Xavier Goodall to graduation and the University of Richmond, but now Patrick Henry must deal with sophomore quarterback Jalon Jones, who has improved with every game and is starting to give the Warriors big-time legitimacy in their offense. Led by Akeem Smith, their defense is already well-known, and will have to contend with Patrick Henry's offense, which after struggling in the first half at Mills Godwin, exploded to lead the comeback. Josh Guerrero, Justin McCowan and company must produce, and spread the wealth, as it were, so Henrico doesn't try to key on how Hunter Hart is utilized offensively. Watch the kicking game in this matchup, as a missed extra point, or good punting to consistently put the opponent deep in their own territory could make a big difference. Henrico won 26-7 last year. Expect this time to be closer, with either team capable of the victory. Meanwhile, Lee-Davis goes to Varina looking for back-to-back wins over the Blue Devils, something that hasn't happened in a long time. We'll see which personnel are available for head coach Ryan Turnage and company, as the Confederates, again, face a 1-2 Varina squad, who, like Hanover and Atlee, can ill afford to go to 1-3 and seek an easy path to the playoffs, especially in the 5A South Region. Lee-Davis, in the same region, sees big opportunity if they can continue to pile up wins, with big guns Hermitage, Highland Springs and LC Bird all no longer in the ranks of the unbeaten. If the Confederates want to really prove they've arrived in the Central Region, a win at Varina begins the pathway. Getting a home game, or two, in postseason play would be huge. But it's still September. The team must focus on only the game at hand, and must avoid lack of composure issues that affected them during their win over Glen Allen a week ago. A victory puts LD at 4-0 with Armstrong next week, then rival Atlee coming to Route 360 in two weeks. The Confederates must control tempo, and not turn the ball over, and count on their experienced offensive line to pave the way to victory. The final scores, on the surface, are impressive. 51-0, 44-10, and now, 34-16. But dig just underneath the surface of Randolph-Macon football's 3-0 start, and you will see, as head coach Pedro Arruza does, a team still learning to execute, and learning to win. The Yellow Jackets enjoyed a strong performance offensively in the first half, as Tre Frederick, Eric Hoy and Dom Kaopua all scored on short touchdown runs. But another extra point attempt was missed, the third in as many games. The defense allowed a late Methodist touchdown with 31 seconds to halftime, making a 20-3 lead just 20-10. In the second half, an interception from Joe Vairo (15-of-24, 252 yards, 1 TD, 1 INT) and two critical fumbles by Frederick inside the Methodist ten-yard line, ending potential touchdown drives, kept the Monarchs in the contest. But the defense did enough, and the offense reignited, scoring two fourth quarter touchdowns to secure the first 3-0 start, and non-conference sweep, for Randolph-Macon in five years. "I haven't looked at the film, but it's pretty disappointing," Arruza noted in his office after the game, addressing his players in the locker room beforehand to express his feelings. "We'd better improve a lot, or it's going to catch up to us." Arruza listed several goals that were handed out in practice last Monday, and each of them, from pursuit angles to holding onto the football, were issues for the Yellow Jackets. And, while Randolph-Macon's defense only allowed 42 yards of rushing, they were torched for 356 passing yards, 82 of them on a touchdown by Methodist with just over a minute to go. Monarchs quarterback Xavier Adams, given time in the pocket, and, other times buying time via the scramble, completed 24 of 44 passes for 356 yards, two touchdowns, but a key second half interception on a pass tipped by JP Redmond and hauled in by Eric Long. Adams attacked the secondary given the Yellow Jackets' defensive line's inability to get to the quarterback consistently like they did in three quarters last Saturday in the 44-10 win over Averett. Catholic and Randolph-Macon have ended their non-conference schedules at 3-0. Surprisingly, Hampden-Sydney, picked second in the Old Dominion Athletic Conference (ODAC) preseason poll behind defending champion Washington and Lee, is 0-3. The Generals themselves are struggling, falling late to Claremont-Mudd-Scripps Saturday evening 31-28 to fall to 1-2. There is no doubt the Tigers, Generals, and others, will right their ships. Everyone is 0-0 in conference play. The door of opportunity is there for Randolph-Macon, picked to finish fifth overall. But the Yellow Jackets must quickly fix the problems that are there, before, as Arruza says, they catch up with them. Randolph-Macon is off next Saturday, then begins ODAC play with a Thursday night game at Shenandoah (2-1) on September 29th. The Yellow Jackets return to Day Field for Family Weekend October 8th against Bridgewater (1-2) at 1pm. GAME OF THE WEEK: #9 Douglas Freeman 20, Atlee 14: Rebels score three 4th quarter touchdowns for the second straight game, the winning score with 6.2 seconds left to fell Atlee, who is now 1-2. #8 Lee-Davis 43, Glen Allen 0: Confederates roll past Jaguars, but lose players to ejections in the first half; could miss Capital District opener at Varina next week. #11 Hopewell 28, Hanover 13: The Hawks are 1-2, worst start since 2006, when they began 0-4 before rallying for a 5-5 record and first of ten straight postseason bids. Patrick Henry 31, Mills Godwin 28: Patriots, now 3-0, down 21-0 at halftime, score 31 in the second half, Hunter Hart scores winning touchdown in final minute. Patriots host 3-0 Henrico next Friday. CLICK HERE to listen live to the Game of The Week as #9 Douglas Freeman comes to Atlee in the home opener for the Raiders! The game is also available on radio on WHAN, 102.9 FM, 1430 AM, and on any mobile device with the TuneIn Radio app, search "Radiall"! Save "Radiall" to your favorites and listen to the Game of The Week every Friday night during football season! We go live at 6:30pm with the On The Sidelines Pre-Game Show Powered by Sheehy Ford of Ashland as Rob Witham and NBC12 Sports Director Marc Davis break down Week 4 across the Central Region! On the heels of Lee-Davis moving up another position to eighth in the new NBC12/RVA Sports Network Big 12 High School Football Poll Monday, here is a look back at their 47-17 win at Prince George Friday from RVA Sports Network Intern Correspondent Bryan Diehr. The Confederates of Lee-Davis High School traveled to Prince George Friday night in a showdown of 5A South contenders. coming off of a 35-0 thrashing of J.R. Tucker in week one and the Royals came off a nail-biting win against Clover Hill 28-24. The tough front seven of LD would be the first real test for senior running back Malaki Gurley who had 230 yards on the ground to go with three touchdowns last week. Senior running back Nathan Evans of LD with a slow week last week (22 carries for 87 yards) looked to rebound against the Royals. Prince George jumped out to an early 7-0 lead on their first drive courtesy of a 23 yard heave from Edward Walker to receiver Keith Brown. After that, the Confederate run game was unstoppable with rushing touchdowns by Nathan Evans and Hayden Walsh before the end of the first. Three more LD rushing touchdowns, two coming from Evans, blew the game wide open before the half, giving Lee-Davis a comfortable 34-7 lead at the break. A slow offensive second half on both sides but the Confederate defense stayed strong forcing one pick-six and just ten points to the Royals offense. Sophomore Quarterback Zach Lass was able to connect with Senior Tight End Connor Scott for a seven yard touchdown in the third quarter which was the icing on the cake. Lee-Davis came out with a thrashing 47-17 victory over Prince George to improve to 2-0 on the young season. Evans had a big night, rushing for 153 yards and three touchdowns on 17 carries. Also helping out in the run game were seniors Hayden Walsh (12 carries, 54 yards, 1 TD) and Jarel Braxton (6 carries, 74 yards, 1 TD). Zach Lass threw for a solid 128 yards along with a Touchdown to Connor Scott. Huge defensive help from Andrew Anthony and Jamir Johnson as both came up with an interception in the second half. Royals’ powerhouse running back Malaki Gurley was shut down most of the night as he was held to just 59 yards on 17 carries. Also, Edward Walker was just 10-28 passing with 137 yards along with a touchdown to Keith Brown. Lee-Davis Coach Ryan Turnage was not happy with how the second half went offensively. They put up just 13 second half points, seven of them coming off of an Andrew Anthony pick-six. Last week, they put up just 14 second half points against J.R. Tucker. “We have to figure it out. We played great in the first half but came out slow on offense in the second. We need to be able to play the whole game,” said Coach Turnage after the game. The Confederates are stacked with a triple threat in the backfield with three seniors. Led by Nathan Evans, Hayden Walsh and Jarel Braxton both get carries to give Evans the needed rest. The three rushers combined for 171 yards and five touchdowns on the ground. Coach Turnage is satisfied with his rushing attack in the first two games so far. “It’s great to give Nate a rest. It takes the pressure off of him. We just have to keep coaching them up and getting better every week,” said Coach Turnage. 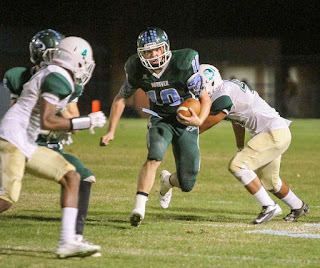 Evans’ rushing attack takes a lot of pressure off the sophomore quarterback in Zach Lass. Lass now has had two games under his belt to get used to the playbook and playing on the varsity level. He is relieved to have such a breakout running back behind him. “We can rely on him to pick up yardage so I don’t have to make the big throws on every drive,” said Lass. Lee-Davis is back at home to host Glen Allen next Friday. They look to shut down the passing attack from Alex Faniel in hopes to improve to 3-0 this season. #9 Lee-Davis 47, Prince George 17: 153 yards for Nathan Evans as the Confederates pull away at Prince George to move to 2-0. They'll host Glen Allen next Friday. Patrick Henry 35, Glen Allen 25: Two touchdown runs for Josh Guerrero and a 75-yard Pick Six for Devyn Coles pace the Patriots (2-0) to a victory. They go to Mills Godwin next Friday. Mills Godwin 48, Atlee 28: Eagles running back Wesley Dugger rushes 36 times for 310 yards and seven touchdowns, accounting for 42 of Godwin's points. The Raiders fall to 1-1 and open at home next week against #10 Douglas Freeman on the Game of The Week on WHAN (102.9 FM/1430 AM) and The RVA Sports Network. Hanover 34, J.R. Tucker 28: Clayton Cheatham wills the Hawks to a comeback win in the fourth quarter to move Hanover to 1-1. They host 1-1 Hopewell next Friday. The Patriots look to beat the Jaguars for the second straight year, but this time without Hunter Hart, still out with an injury. It will be the home debut for new Glen Allen head coach Salvatore Camp, who's looking to instill a new attitude in Jaguar Nation. WEB: CLICK HERE to listen live! Nathan Evans and Zach Lass look to pace the Confederates, coming off an opening 35-0 win over J.R. Tucker at home. Prince George is hosting their second straight game after nipping Clover Hill 28-24 last Friday. After losing their first season opener since 2006, the Hawks will look to right the ship at J.R. Tucker, who holds their home opener after losing to Lee-Davis. A much better test for the new-look Raiders. It's the home opener for the Eagles, who are smarting after falling 37-6 at Henrico last week.